The confirmed death toll from the Sewol ferry disaster has reached 244, South Korean officials have announced. Meanwhile President Park Geun-hye met relatives of those on board. 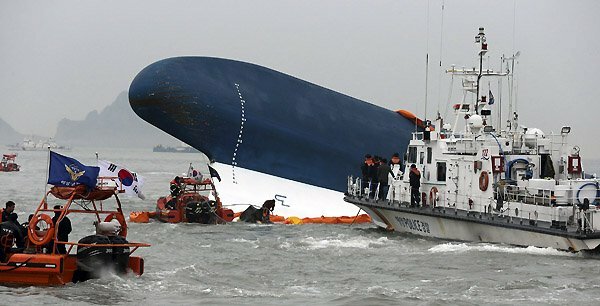 Park Geun-hye told family members that those responsible for the ferry sinking on April 16 would be “punished severely”. The Sewol ferry had 476 passengers on board when it sank – 174 were rescued, and 58 remain unaccounted for. Prosecutors say the ferry owner ignored safety warnings and allowed the ship to be overloaded. Park Geun-hye visited Jindo island, close to where the ship sank, on Sunday. It was her second meeting with the family members. “A thorough investigation will be conducted to find those who were responsible and criminally at fault… and they will be punished severely,” she added. Authorities are investigating whether the ship sank from overloading and changes in the structure of the ship. Anger has also been directed at the ship’s captain and crew members, who delayed giving evacuation orders. Last week, South Korean PM Chung Hong-won resigned amid criticism of the government’s handling of the disaster. Divers have been navigating the sunken ship in an attempt to retrieve the remaining bodies. However, the search has been hampered by strong currents, debris, and poor visibility. Several divers were suffering from decompression sickness, Yonhap news agency reported on Friday.